Bedford Town were back in action on Tuesday night as they looked to put the unfortunate events of the weekend in the rear-view mirror. 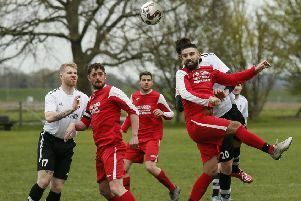 The Eagles home game against Fleet Town was postponed in controversial fashion just 10 minutes before kick-off on Saturday after the Bedford players refused to play. Fans were issued with refunds and Bedford chairman David Howell said that ‘the reasons behind their actions are unclear’ but the events will be subject to a league probe. The Eagles travelled up the A5 to face high-flying AFC Dunstable, with the game going ahead. Bedford started well on a bitterly cold night with David Manu going close twice. In the 22nd minute Eagles’ keeper Kyle Forster’s luck was out when Nathan Frater raced on to a through ball to hit a powerful, low shot that squirmed out of his grasp to hit the back of the net for the only goal of the game. As the game neared the end, tempers flared after Bedford’s Devante Stanley and Dunstable’s Moses Olaleye had a few confrontations before a free-kick. The second set-to prompted a mass handbag-shoving from nearly all the outfield players. Soon after, AFC’s Brett Longden was sent off after a second yellow card for lashing out at Stanley. More jostling ensued when the two dugouts came together and further shenanigans happened after the final whistle, but the peacekeepers in each side stepped in to sort it all out. The Eagles stay in 11th and this Saturday travel to second-placed Moneyfields.